On Saturday 21 May 2016 at 08:30, Tom Coetzee from Thornybush Nature Reserve was radio’d from a ranger out on a game drive with news that a lone white rhino calf had been spotted. The calf was in distress and appeared to have blood on its face. On arrival, Tom and his team trailed the calf through the bush, but lost it after encountering a leopard close by. The smell of carrion in the air suggested that the leopard may have had a kill. They detoured, but continued the search. To their surprise, the leopard was staying close to the carcass of the calf’s mother. After two hours of searching, one of the Anti-Poaching Unit team members noticed the calf, more or less in the same spot as it had been earlier that morning. Fortunately Dr Rogers had already joined them, so he quickly immobilised the little rhino. 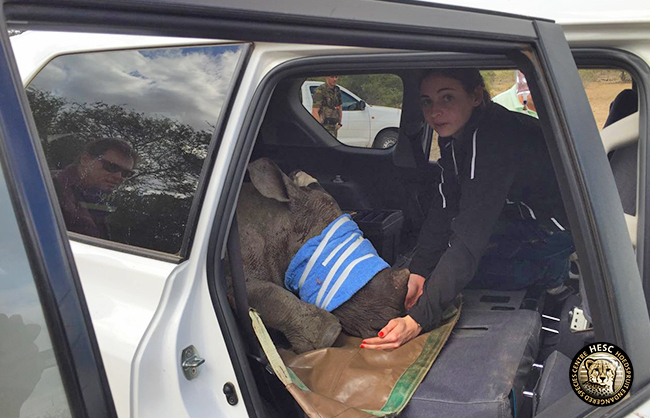 The calf was then brought to HESC where she was stabilised, and Tom and his team handed her over to our team. A helicopter had, in the interim, arrived in the area and located the carcass of the mother with her horns still intact. She appeared to have been dead for about three days, and the blood on the little calf was from lying down next to her mother’s body. 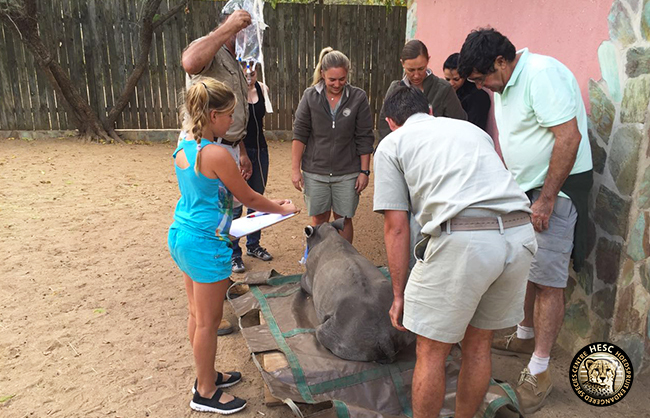 The baby rhino also had minor bite wounds on her back, possibly from a hyena attack. 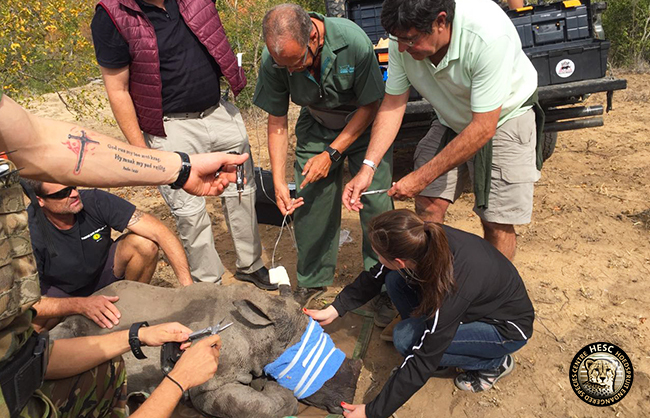 During the necropsy on the dead rhino, an entry wound was found with a large calibre projectile located in her abdomen. It is hard to say how long she survived with the wound, but all indications are that she survived quite a number of days before she died. Khulula (which means ‘to rescue’ or ‘set free’ in Zulu), estimated to be about four months old, took well to the bottle from the onset. Curators, Christo and Linri, took turns feeding her and she would go to sleep after each feed. She is drinking 1,9 litres, seven times a day, which totals 13.3 litres per day. She weighs 136 kilograms. We tried introducing her to Olivia, but noticed that she was not yet ready. However, we’ve set up a small opening between the two to acclimatise our new arrival to Olivia’s scent. Khulula passed dung on Monday, which is a great sign and shows that she has no interior obstructions. We are pleased with Khulula’s condition at the moment. She is improving in our care, and doesn’t appear to be in any pain from the scrapes on her back. We will keep you posted as to her progress. If you can and would like to make a donation towards the rhinos in the Rescued Rhinos @ HESC sanctuary, visit our online portal. Alternatively go to PayPal, click on ‘send’, add the WCT email address accounts@wildlifeconservationtrust.co.za, choose the amount you’d like to contribute and click ‘continue’. It breaks my heart each time I read such information. Heartened greatly though that there are a body of caring people to try and keep these babies going and therefore keep the species quite literally, alive. I too will be more supportive, financially. We saw 8 rhinos : Olivia, Muddy and Nhlanhla plus the tiny new one Khulula, with their curator taking pictures. Meanwhile the biggest Little G, Matimba, Stompie and Balu taking their morning sunbath in the park near the hut ! Soon or late the HESC will become the Rhino’s Park ! Thanks to the curators and all the staff ! Another heartbreaking tragic end for an adult rhino at the hands of ignorant, cruel, greedy humans. Thank the heavens for the HESC staff and all the donors who try to heal the suffering from the babies so they may lead healthy, long, safe lives. 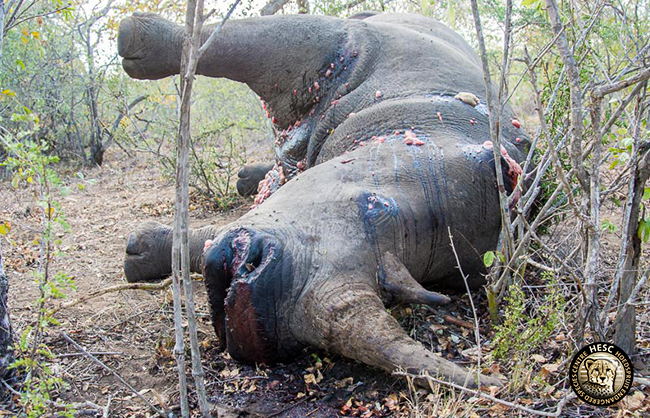 But to those poachers I say this, one day you will meet your maker as you descend to hell. You will find a special place there just for you. #EverySingleRhinoCounts. Thank you so much for the work you do. I have been there to see firsthand the beautiful animals you have saved. God bless you. 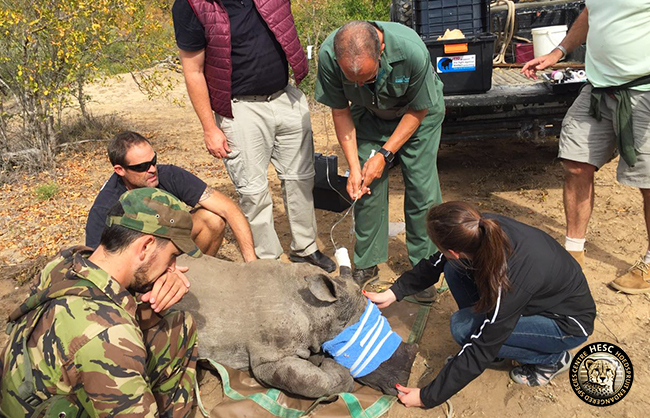 Once again, your amazing team stands up for innocent rhinos in need, with incredible success. From the orphan rhino cam, it does indeed seem that beautiful Khulula is now bonding nicely with the equally beautiful Olivia, Muddy, and Nhlanhla; a gorgeous sight indeed! And it appears the four all intrigued by their big brothers, Gertjie, Matimba, Stompie, and Balu, and have been making introductions through the fence. So very thankful that they are all safe from cruelty at HESC.